Cure, a well-regarded Pittsburgh restaurant along the Allegheny River, found itself on the brunt end of the internet police stick in May of 2017. It happened after a one-night-only collaboration dinner with several Canadian chefs in which Cure served a food almost never seen at American restaurants today: horse meat. No animal has been anthropomorphized more in popular culture than the horse, portrayed as man’s noble companion through centuries of literature and decades of television and film. Horses are sports heroes (The Black Stallion, Seabiscuit), noble warriors (War Horse), fodder for comedy (Mister Ed); are made to feel human emotions (The Horse Whisperer, Black Beauty); and can cure a broken heart (“Tennessee Stud“ by Jimmy Driftwood). The horse has crossed the threshold of an animal that’s become more than an animal, and therefore Americans don’t see a horse and think “food.” But unlike the dog, another beloved human companion that Americans don’t eat, horse is a ubiquitous meat in many parts of the world. While eating horse meat in America is not illegal, finding a purveyor that sells it is all but impossible. American chefs who want to serve horse might resort to sneaking the meat across borders (representatives at Cure declined to comment for this story, but chef Justin Severino said the meat was sourced from a sustainable horse farm in Alberta, Canada). And yet, in cities as close to the U.S. as Toronto and Montreal, horse meat has become so ingrained in fine-dining culture that it’s as commonplace as venison on menus. Up until 2007, the U.S. was home to a number of horse slaughterhouses, but the meat it produced was exported to Europe. Those remaining facilities—in Illinois and Texas—were shut down by laws in their respective states. On the federal level, Congress passed a measure that banned funding for the United States Department Of Agriculture to inspect horse slaughterhouses. (Horse meat production never really stopped, though—American horses were transported to Canadian and Mexican plants.) In 2011, the Obama administration lifted the ban on USDA funding—proponents argued it would help control the rising wild equine population—but the ban was reinstated in 2014. The law does not explicitly ban the slaughtering of horses, but effectively prohibits the sale of horse meat in the U.S. In May 2017, the Trump administration proposed easing the ban once again. Citing the rising costs that the Bureau Of Land Management spends on feeding wild horses—about $50 million a year—Trump’s 2018 fiscal budget includes a provision that would “humanely euthanize” wild horses and sell them for slaughter, at a savings of $10 million. 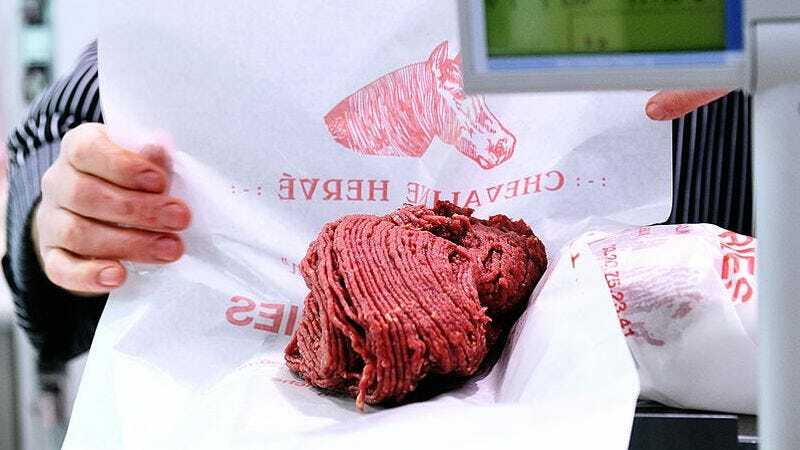 While the American public likely won’t demand horse meat with the frequency of beef and pork (“I can’t envision it happening any time,” says Mark Dopp of the trade association North American Meat Institute), there are those in the food world who see value in horse meat as part of the American culinary landscape. But they cite reasons beyond its gastronomic qualities, like relieving the overburdened, and in many cases cruel, conditions of the commodity meats industries.